Hughes Pumps | Humanex-Tech Kft. Water jetting can be used to clean virtually any surface & remove any type of deposit & is very controllable. It can be as delicate or aggressive as required by adjusting pressure, flow, type of nozzle, stand-off distance & traverse speed. Low volumes of water are used & unlike other methods such as grit blasting, there is minimal clean up after the job is done. Depending on the application, fresh or seawater can be used as the cleaning medium. One advantage of water jetting equipment is that a typical contractor size pump (60lpm at 1000bar) can be used for a wide variety of cleaning applications by selecting the correct accessory. 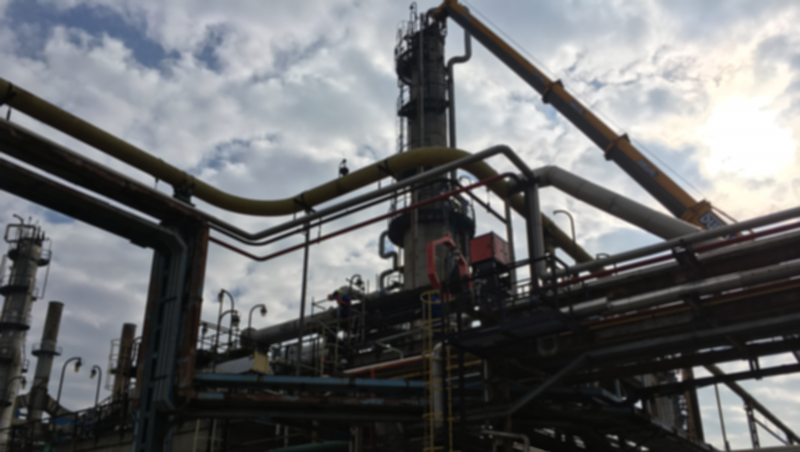 For example, if working in a refinery, the same pump can be used for heat exchanger cleaning, pipe cleaning, vessel cleaning, drain cleaning, cold cutting, surface preparation & general plant cleaning. Depending on the application, fresh or seawater can be used as the cleaning medium. Surface preparation generally refers to the stripping of coatings & corrosion using Ultra High Pressure (UHP) water jetting equipment at 2000-3000bar (30,000-43,500psi). At these pressures the velocity of the water jet is 500-600m/sec (Mach 1/speed of sound is 340 m/sec) which will strip the toughest of coatings with plain, fresh water. Hughes Pumps manufactures a range of UHP pumps to cater for various surface preparation tasks, from the compact UB10, single gun unit for blasting small areas typically offshore on oil & gas platforms or on ships during voyage where space & fresh water are at a premium, through to the larger UB24 which can be used with single or twin jetting guns or with an automated crawler for stripping large areas, typically ships hulls & oil storage tanks. The velocity of the water jet is over the speed of sound which will strip the toughest of coatings with plain, fresh water. Heat exchangers used in industry are prone to scaling & blocking which drastically reduces heat transfer & efficiency of the process. High pressure water jetting is the fastest & most efficient method of cleaning internally & externally. At 1000bar the water jet removes scale & blockages with ease, leaving a polished finished on the inside wall of the tube thus slowing down future scale build up. Each lance will pass 30-40lpm at 1000bar. The smaller pumps are generally used with a single lance & foot operated control valve to control pressure on/off. The lance could be hand held but Hughes Pumps recommend a TLX which takes the lance out of the operators hands for increased safety. As pump size/flow increase as can the quantity of lances, up to the 5 lance bundle blaster for maximum productivity, automation & safety. At 1000bar the water jet removes scale & blockages with ease. The pump is versatile & can be used for other cleaning applications in the plant e.g. pipe cleaning, tank cleaning etc. Process pipe work in industry becomes corroded, scaled up or even totally blocked which reduces plant efficiency, even stopping production. 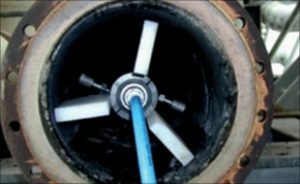 A range of pressures between 500 & 3000bar can be used to clean pipes, depending on the type of deposit but 1000bar is a useful performance for a variety of cleaning tasks. Fixed or rotating nozzles with partially rearward facing jets create thrust which pulls the hose into the pipe. The spent water then flushes the debris to the open ended pipe. As pipe diameter increases, more flow is required to provide adequate flushing & nozzle centralisers are used with extension arms to keep the nozzle close to the pipe wall for maximum impact. 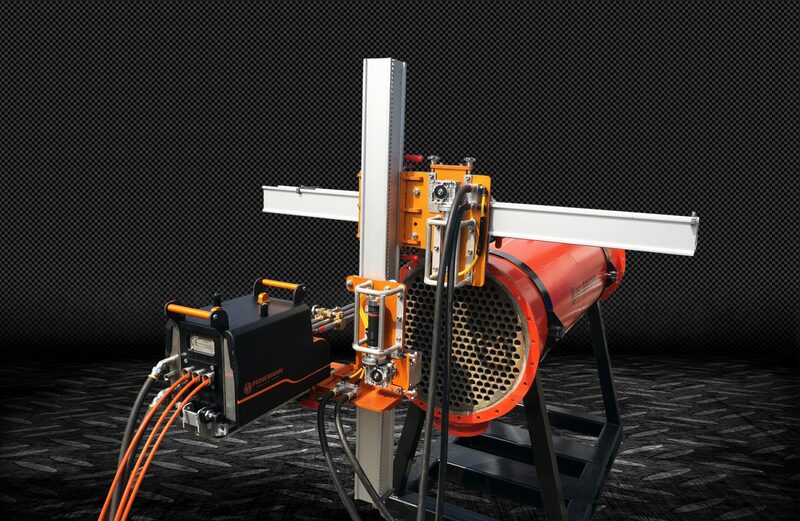 The Rotocar Cleaning system allows very long pipe runs with multiple bends to be cleaned from one end. A special unbalanced nozzle hugs the pipe wall while the hose is rotated & fed into the pipe. 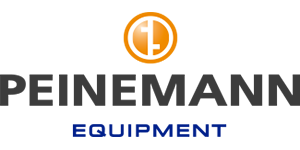 Drill pipes/tubulars require regular non-destructive testing (NDT) to prove their integrity. Water jetting at 1000bar (14,500psi) is the preferred method for cleaning prior to inspection. Corrosion, wax & cement products can be removed in a single pass, even if the pipe is completely blocked. 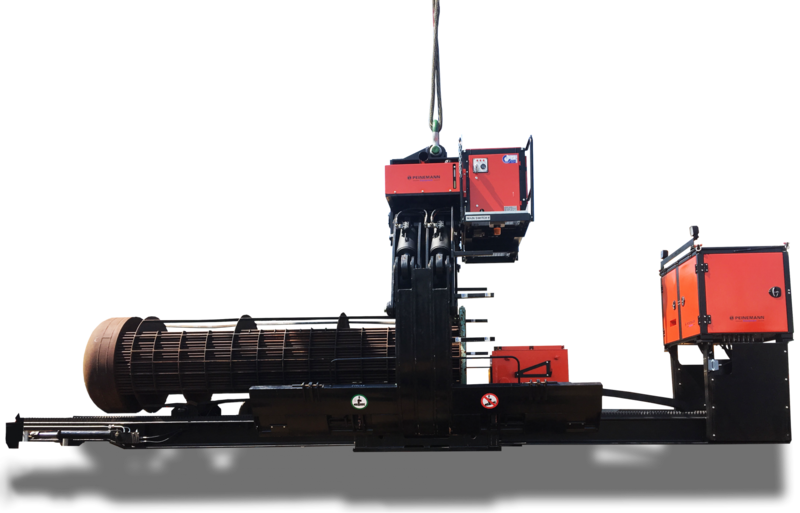 Typically the drill pipe is loaded onto rollers that rotate the pipe while high pressure rotating nozzles are fed into the pipe on a rigid lance & along the outside. If a single HPS2200 pump is used, a diverter valve is used to switch pump flow between the inside & outside nozzles. On a twin pump system it is possible to clean inside & outside simultaneously in almost half the time. 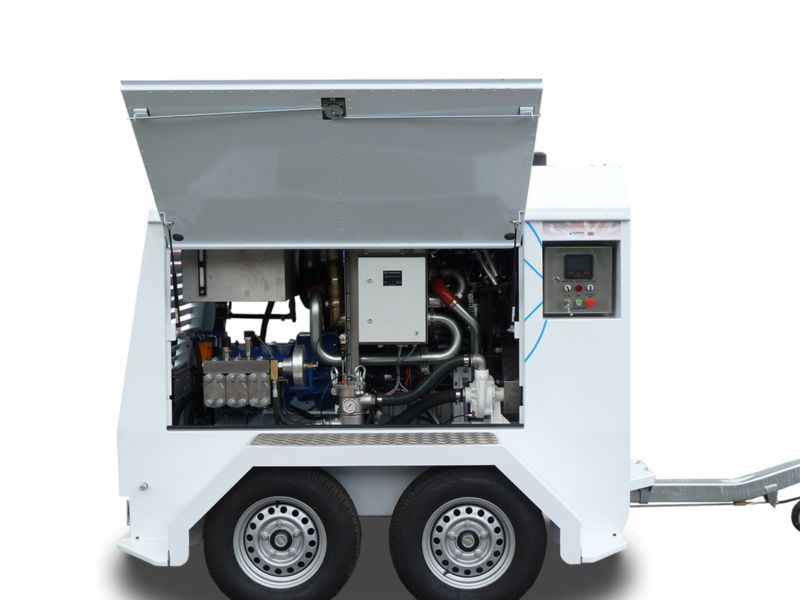 The pump(s) can be driven by a diesel engine making it mobile or driven by an electric motor for low maintenance, fixed installations. Any industry that uses tanks, vessels, autoclaves, driers etc. for mixing, processing or drying products can benefit by using a Hughes Pumps non-man entry, automatic tank/vessel cleaning system. 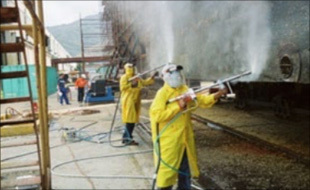 Historically personnel with PPE and breathing apparatus would enter the tank and manually clean using pressure washers. With more emphasis on Health and Safety, we have developed systems that include one of our high pressure pumpsets that feeds a tank cleaning nozzle which is water powered and rotates in two planes to bring about total, automatic cleaning of the entire tank surface. The nozzle has adjustable rpm which enables the cleaning cycle to be adjusted between 5-60 minutes. The nozzle can be lowered into the tank from a hosereel and locked in position for the cleaning cycle. In larger tanks the nozzle can be fixed at 2 or 3 different heights. Hydrodemolition (also referred to as concrete cutting) is a process of using a water jet at 1000 to 1400bar (14,500 to 20,000psi) to remove loose, deteriorated & damaged concrete from road bridges & other concrete structures & to expose steel reinforcing bars for inspection. Many jobs are carried out using a hand held jetting gun. In these circumstances the reaction force created by the water jet should not exceed 250 Newton’s (25kgf) to ensure the operator can work in a safe manner e.g. 35lpm at 1400bar. Higher flowrate increases reaction force so the cutting nozzle needs to be constrained. At 120lpm at 1000bar it is common to use a gimbal device to connect the jetting gun to. For maximum productivity the HPS5000 pump with a performance of 200lpm at 1000bar is coupled to a hydrodemolition robot. Abrasive cutting is a term used when UHP water at 2500-3000bar is mixed with fine abrasive to form a powerful cutting jet able to cut through steel & concrete centimetres thick. 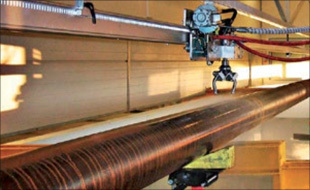 The water jet travels at 500-600m/sec, carrying the abrasive which cuts the material. Within the cutting nozzle assembly, the velocity of the water jet creates a venturi effect which draws in fine, dry abrasive which is metered from a nearby hopper. As there is virtually no heat or spark generation, this process is also referred to as Cold Cutting & is commonly used in hazardous areas such as in refineries or on offshore platforms. The abrasive nozzle attaches to a manipulator which is generally attached to the steel surface being cut with magnets. The nozzle is then moved with a hydraulic or pneumatic motor at a controlled speed depending on the thickness of the material being cut. Water jetting is commonly used at 1000bar subsea for stripping marine growth form ships hulls, oil & gas platform legs & marine structures. Concrete weight jacket on oil pipelines can also be cut away for inspection of welds etc. without damaging the pipe. Most work is carried out by divers using a hand held jetting gun fitted with a retro-jet which balances the diver in the water. For this reason it is common to use higher rated pumps for this application as only 50% of the pump power is utilised for cleaning/cutting. Pumps for this application use seawater so the pumps are constructed with stainless steel pumpheads (431,316 or Duplex). For deep water work a jetting device is attached to an ROV, Hughes Pumps have even manufactured ROV mounted, marinised pumps for use 2000m subsea where it is not practical to use high pressure hoses from the surface. Hughes Pumps supplies many pumps for pumping seawater at high pressure. The pumpheads and wetted components are manufactured in 316 or Duplex stainless steel to provide corrosion resistance. 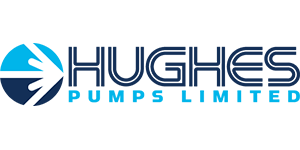 Hughes Pumps have taken this even further and have a proven track record in supplying high pressure pumps for use subsea, mounted to ROV’s (Remotely Operated Vehicles) and used up to 3000m (10,000 ft.) subsea. The pumps are used for cleaning, cutting and trenching applications as well as pumping Ethylene Glycol (MEG). It is not possible for divers to work at such depths, nor is it practical to run high pressure hoses from the surface to such extreme depths. Mounting the pump on the ROV maximises the e ciency of the pump as there is no pressure loss in high pressure hoses. 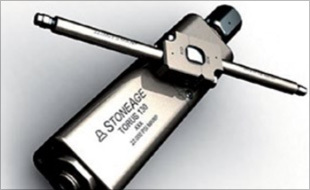 An hydraulic motor is close coupled to the pump crankshaft via a lightweight, anodised aluminium bell housing and exible drive coupling making a very compact, lightweight installation. 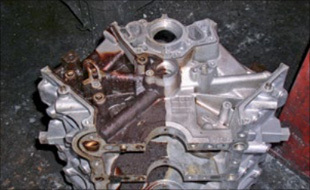 Key to the company’s success with this specialist application is modifying standard pump materials to provide adequate corrosion protection and preventing seawater from breaching the crankcase oil seals and contaminating the lubricating oil. At 3000m depth the ambient seawater pressure is 300bar (4,350psi) which requires some complex engineering to protect against. The pump range is available at up to 3000bar and 375kW (43,500psi and 500hp). Water jetting is widely used in the ship repair & marine industries. 300bar is used to remove marine growth & salt deposits prior to grit blasting. Larger pumps can be specified to allow multiple jetting guns to be used simultaneously. 700-1000bar will remove loose coatings & corrosion, leaving sound coatings intact, ready for repainting if total coating removal is not required. It is often said that if 1000bar does not remove the coating then it is sound enough to paint over. 2750bar (UHP) will remove all coatings & corrosion back to white metal. Marine paint manufacturers have developed paints to apply to hydro-blasted surfaces & actively promote this method as it removes all chlorides & provides the best possible surface for recoating. Steel plants are notoriously tough environments to work in with equipment exposed to extreme heat, dirt, poor water quality & weather. 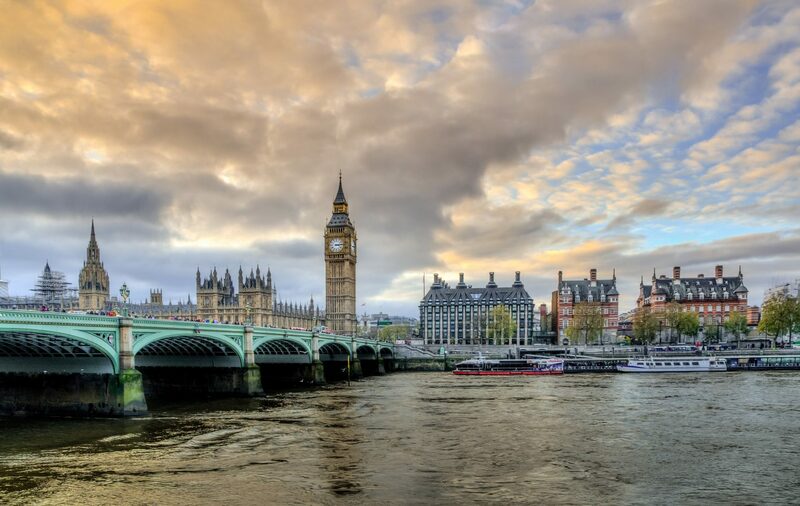 Hughes Pumps have been supplying the global steel industry since 1970 & still have pumps operating in critical applications that are more than 20 years old. Hydromechanical Descaling of strip, slab, plate or blooms during hot rolling removes iron oxide scale layers thus improving surface quality. Water based hydraulic systems are used in hot-metal areas of steel mills for fire resistance. Water- based hydraulic fluid is lower in cost than hydraulic oil, non-toxic & biodegradable. Automotive plant paint shops suffer from overspray paint on dollies, skids & floor grates which can become detached & contaminate newly coated vehicle body shells, leading to expensive manual rework. An immaculate vehicle paint finish is only possible if the paint shop is contaminate-free & water jetting achieves that. Paint shop floor grids are generally cleaned outside of production hours using push along floor cleaners which contain the water & debris. Hand held jetting guns are used to clean smaller, intricate areas. To clean dollies & skids on-line, without disrupting production, water jet nozzles can be attached to robots for automatic cleaning. Frequency of cleaning, type of paint etc. will determine what pressure is used, but typically between 900-2750bar. Water jetting can also be used to strip paint from jigs & hangers used in any paint shop. For privacy reasons Vimeo needs your permission to be loaded. For more details, please see our Adatvédelmi irányelvek.